Early on Monday, test train No 55001 left Harbin West Railway Station in Heilongjiang province to begin trial runs on the longest high-speed rail line in China's cold zone. The 343-kilometer line with 19 stops links Harbin to Jiamusi. Construction began in July 2014 as one of the key projects in China's medium and long-term railway network plan. The country's railway network is expected to hit 175,000 km by 2025, up significantly from 127,000 km of operating track last year. The line must withstand extreme low temperatures in winter, which poses major challenges to railway construction and the trains themselves. 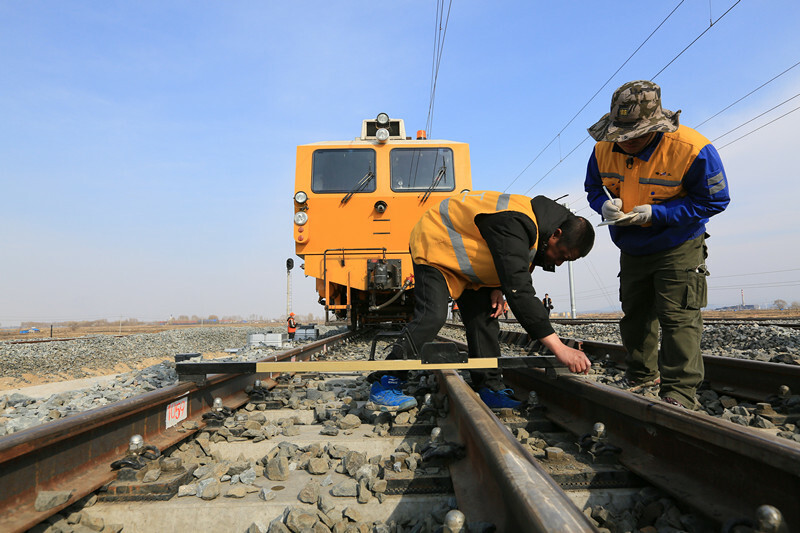 "The railway builders looked into the experiences of high-speed railway line construction in relatively cold areas and used all the measures that they could come up with to ensure the safety of this project," said Cai Kelin, a China Railway Harbin Group official. "The CRH5A high-speed trains on the line are designed to withstand the climate in areas that may be hit by blizzards and temperatures as low as-40 C.
"Some sections of the bullet trains have been transformed," he said. "Then they can withstand adverse weather, such as strong winds, heavy rain, snow and fog." "Different from the existing high-speed railway lines in the province - such as the Harbin-Dalian and Harbin-Qiqihar lines - the Harbin-Jiamusi high-speed railway is built through a mountainous area, which brings some difficulties for operating trains," said Yu Hailian, assistant engineer at the group's locomotive depot. "There are more curves, bridges and tunnels on the line." "A total of 28 drivers participated in the test, which started on May 1," he said. "After repeated operations on the line, they have become quite familiar with it and can keep the train steady even through a 3,410-meter tunnel without slowing down." The new line, designed for trains that run up to 200 km/h, cuts travel time between Harbin and Jiamusi from seven hours to about two. "The line is expected to go into service in September, which will greatly improve transportation and economic development in Harbin, Jiamusi and surrounding counties, especially for the three counties of Binxian, Yilan and Fangzheng," Cai said. "Residents in the three counties will welcome trains for the first time." Liu Jinzhu, 37, a middle school teacher in East China's Jiangsu province, is looking forward to the opening. "Every Spring Festival I go back to my hometown in Binxian county with my wife and daughter," he said. "We travel by bus for an hour and a half - more than 100-kilometers of road - from Harbin to the county. Sometimes the road will be closed because of heavy snow in the winter, which is inconvenient for those in a hurry to get home. The trains will change that greatly."